I called France Telecom on Oct. 3rd to have my phone/internet service started. I've had all the equipment...Livebox, cables, filters, secret passwords, etc. for weeks. Heck, I've even had a bill. All for service that I haven't had....until this afternoon. It's a long story. Evidently there were issues because my friends who I rent this house from are still using the number that they had when they lived here. It's complicated, and I'm not sure I'd get it even if I understood French. 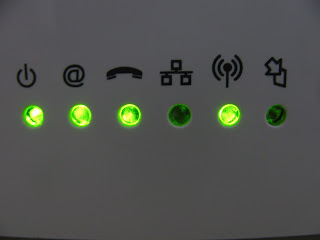 Then France Telecom insisted they had hooked me up, however I still only had flashing red lights everywhere. No one quite knew what the problem was. But the bottom line is a guy came today, climbed the pole in front of the house, did something to the exterior line that took less than 3 minutes, and voila...I have connectivity! Thank goodness for Laury's wireless during this past month and a big 'merci beaucoup!' to Patrick who continued to nag them in French while I nagged them in English!